Hop over to my sidebar real quick (if you haven't already) and help me pick the winner for my caption contest. Voting will close this evening. And now to the REAL issue at hand! This week's verse is below. Looking forward to reading your thoughts. My reflections are below. As I work to make my home "shine" (my realtor's word) so it will be more likely to sell, I am sometimes surprised by what I find. And it has given me a different perspective. For the most part, I tend to clean only when I absolutely have to, and only as much as is necessary. 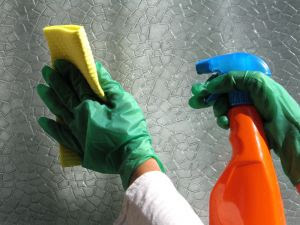 But now that we're trying to sell, my cleaning is much more frequent and more extensive. Instead of just trying to get rid of the mess, I'm trying to "find the clean" beneath it. An example? What I cleaned--really cleaned--the laundry room floor, I discovered that some of the pattern on the linoleum floor actually wasn't a pattern--it was dirt. And once I gave it a good scrubbing, the "real clean" shined through. Of course, once I found that one spot of clean under the dirt, I was especially motivated to find all the rest of it. And I wanted it OFF. In a way, this is like our hearts. When the Lord saves us, he gives us a new, soft heart to replace our heart of stone. (Ezekiel 36:26) When we are new Christians, our soft, supple heart is especially sensitive to sin. But as we spend a bit less time in His Word, and a bit more time focusing on our own wills, wants, and desires, sin starts to slip in and begins to create a kind of hard "coating" on our hearts--much like the dirt that got into the nooks and crannies of my floor. Sure, I might do a general "dusting" or light cleaning of the floor, but I never get back to that original clean unless I am serious about it. And that, I believe, is what circumcision of the heart is about. We cannot truly love, or feel the conviction of our and others' sins as strongly as God desires, if we have the hard, crusty remnants of sin surrounding our soft, supple hearts. And like the physical ritual undergone by Jewish males, the fleshly covering of our hearts must be removed so we can be all God wants us to be. Heavenly Father, circumcise our hearts. Cut away the fleshy covering of sin so we can feel and use the pure, supple heart that you have given us as Your children. May we recognize the sin that is building up and confess it, allowing you to scrub the gunk off it so we can love You with all our hearts and souls. In the Name of Your Precious Son I pray. Amen. Thanks for reading. Be sure to link up below, and/or read other folks' posts on this subject. I think circumcision of the heart means to take 'self' out of the picture. My 'self' gets in the way of so much closeness with G-d. We can't see what He desires when we are constantly seeing what WE desire. Isn't He awesome?! *smile* I think my tiles might not have the same design underneath. Good thoughts...lots to think about! I loved the analogy, JoDear! What a verse you chose for us! Oh my! Awesome thoughts, Jo. Very good analogies with cleaning our house. This is exactly what I am talking about in my most recent post... God kept bringing me back around to this concept of a hardened heart. I didn't think I had one; afterall, that sounds harsh and a defining quality reserved for those pesky Israelites. But I am one of them when I allow the concerns of this world to creep in over and beyond my worship of the Divine. I want a true, circumcised heart, one that graciously bleeds because I am intent on being fully God's. Powerful post, friend, and just what I needed today. Very insightful, Joanne. I'm going to spend quite a while pondering this. I need to find the clean, too. were they fair back then? You do a Great work everyday for us!